If you missed out on our liveblog of Yoshinori Ono's "The Making of Street Fighter IV" panel at Comic-Con — at which very little actual "making of" was discussed, you might not have caught wind of the multiple Cammy mentions made during the presentation. Seth Killian from Capcom mentioned about halfway through the panel that the petite British street fighter had won the popular vote for characters that would appear in the console versions of Street Fighter IV. That's probably a good sign. 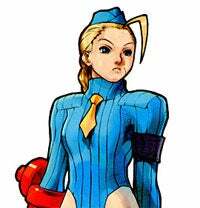 Additionally, a brand new animated sequence shown at the conclusion of the panel showed off various Street Fighter mainstays, including considerable screen time for Cammy. The few-minute animation focused on her disbelief that the Shadaloo organization and M. Bison himself were dead. While still not confirmed, it's looking very likely that Cammy will be one of the "New Challengers" to debut in the console versions, now under development at Capcom.